This unit provides four signal inputs( AUX line input, CD/DVD input, MP3 input, USB input )and 2 analog audio outputs, consisting of 2 sets of stereo channels and a stereo headphone plug with associated volume control. USB input, USB 2.0 decorder to contact with your computer and plays your music collection( compatible with WinXP or later). 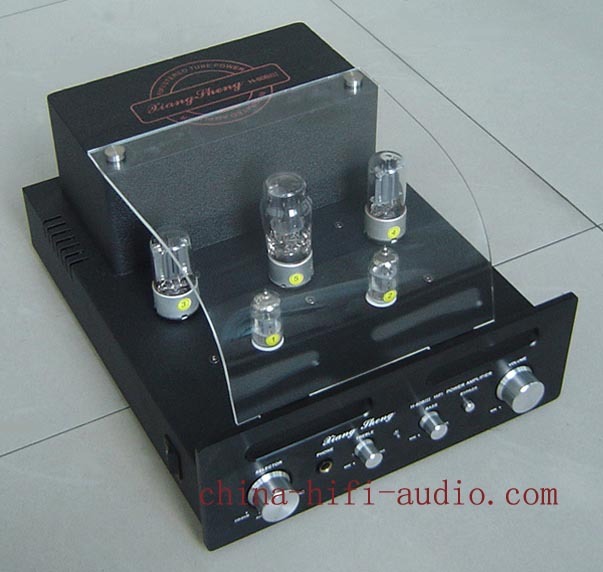 Built in headphone amplifier: allows you to enjoy music with privacy. Great power, music layers and details. Brushed aluminum (8mm thickness) faceplate, with all metal buttons and knobs, plus LED indicator light. Built in treble/ bass control circuit, adjust the treble/bass to desired states. Button in the front panel), so you get a more" neutral" and original sound. preamp, but also a power amp through a black jumper in the rear panel. Using OMRON high current relays protection, make your speaker system more secure while AC applied to the filament power supply, maximally reduces noise, improve the timbre, and prolong the life of tubes. Also equipped with "LINE-OUT" (a mini jack on the rear panel), not only can be used as a sound recording port, but also can be connected to subwoofer(with Low-pass filter) to strengthen shocking feeling of low frequency.